NATO Secretary General Jens Stoltenberg says the alliance is going to increase its activity at its eastern borders, with more air and sea patrols, amid non-stop exercises. Speaking at a media conference on Thursday after a meeting of NATO member state foreign ministers in Turkey's Antalya province, Stoltenberg said it was being done to "adapt the Alliance to new threats." "We are constantly discussing the adaptation of the Alliance and we have to always be able to fulfill our main responsibility and that is to defend and protect all our allies against any threat," the secretary general said. "NATO is the strongest military alliance in the world and we are going to keep NATO strong by adapting." 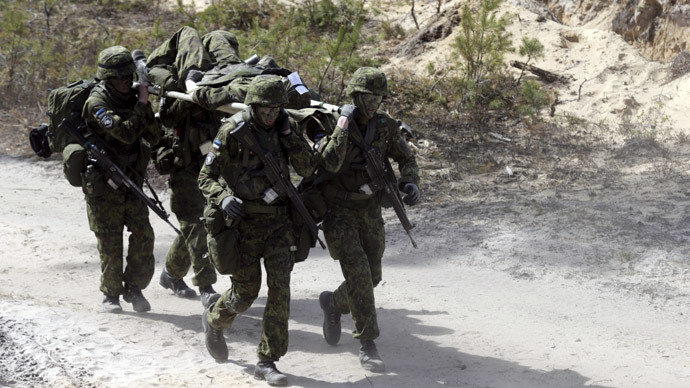 Currently, NATO is planning to double its rapid response force in Europe. "Our main focus now is the implementation of the decisions we already made, and that is to double the size of the NATO response force, to establish this new very high readiness spearhead force," Stoltenberg told the media, adding: "Turkey said that it is going to be one of the lead nations for this high readiness force." He told the media that new NATO command units will also be established in Latvia, Lithuania, Estonia, Poland, Bulgaria and Romania. Earlier this year, plans were announced to bring the total number of NATO troops in the force to 30,000. Stoltenberg also said the activity of the troops will increase, with"more air policing, with more naval presence and also with more exercises. "NATO forces are currently holding a wave of military exercises titled Atlantic Resolve, spanning most European countries and involving forces from every branch of the Alliance military. The number of NATO exercises close to the Russian border have doubled over the past year, exceeding 3,000, according to a March statement by Russia's envoy to the alliance Aleksandr Grushko. The secretary general was also asked about the Baltic States’ recent request to increase Alliance forces stationed in their territory. He said he was aware of it, but hadn't received the letter and could not comment on it yet. He promised, however, to "go carefully through the letter and assess the proposals." The heads of the Lithuanian, Latvian and Estonian militaries earlier sent a letter to NATO's European commander General Philip Breedlove, asking the Alliance to station more forces in their territories. They wanted the combined strength of NATO troops in the Baltics to be brought to brigade level, or two to three thousand servicemen. Currently, each of the three counties has about 150 US troops, with forces from other NATO members rotating in and out for exercises. NATO military leaders, as well as some high-ranking European and US politicians, have repeatedly said that the increase in NATO presence and military drills is a message to Russia, which they accuse of "aggression" and "destabilization" over its alleged involvement in the Ukrainian crisis. The Alliance's secretary general himself has slung hardline accusations at Russia more than once. However, he recently said that it is wrong to say NATO and Russia are in a new Cold War. Moscow, in turn, has repeatedly denied any accusations against it, saying that no solid proof has been provided of any kind of Russian presence in Ukraine. Russia has criticized NATO officials for getting their "evidence" from dubious sources. Earlier in May, US envoy to NATO Douglas Lute admitted he gets most of the information on the situation in Ukraine from social media. Social networks are often cited as the only source of information about the alleged Russian presence by White House representatives.